Veyo President Josh Komenda at a Jan. 12 hearing. Members of a state panel on Wednesday were expecting an update from Veyo, the new medical transportation company that oversees rides for Medicaid recipients and has been the source of numerous complaints since it started working for the state at the beginning of the year. But no one from Veyo showed up, and representatives from the state Department of Social Services, which hired Veyo, said they had excused the company from appearing. The DSS representatives said they were there to discuss Veyo’s checkered performance and to answer questions from the Coordination of Care/Quality and Access Committee, which includes members from the Behavioral Health Partnership Oversight and Medical Assistance Program Oversight (MAPOC) councils. DSS officials said they were working hard with Veyo to resolve the problems but provided no data on improvements. Since San Diego-based Veyo took over operations on Jan. 1, many residents have had to wait hours on hold when calling for rides, have missed or been late for critical medical appointments like dialysis, chemotherapy and behavioral health treatment; or were stranded at medical facilities when return rides didn’t arrive. “I don’t want any of us to have to go to any funerals because a cab didn’t show up,” said Kelly Phenix, co-chair of the committee, at the end of Wednesday’s meeting. After several panel members expressed anger over Veyo’s absence, William Halsey, director of integrated care at DSS, said, since the department has oversight of the contract, he and another DSS employee were there to listen to the issues. Halsey also said that Veyo representatives, including its president, Josh Komenda, presented to MAPOC on Jan. 12. Veyo was hired last year to arrange and oversee about four million rides annually to and from medical appointments and services. Veyo works with a myriad of private transportation companies, including taxis and ambulances, to provide the rides. Before Veyo, the state’s non-emergency medical transportation program was run for several years by LogistiCare — the subject of many complaints. Two representatives from LogistiCare were in the audience at Wednesday’s meeting. 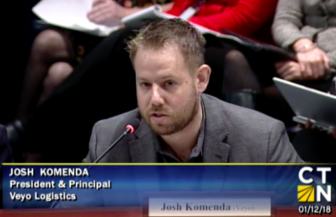 Komenda said that hold times, complaints, bad data and missed trips are on the decline. He said Veyo was preparing detailed data on its improvement efforts and progress and will share it with DSS. Veyo was awarded a three-year contract, with the state paying the company $52 million in the first year, Komenda said. 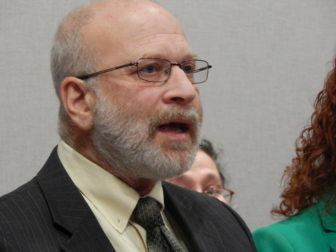 At Wednesday’s meeting, Sheldon Toubman, an attorney with New Haven Legal Assistance, was angered by Veyo’s absence and DSS’s decision to excuse them from the meeting. “I can’t understand honestly what possible reason would warrant your … excusing them from being here to answer questions about whether it’s really true that their improving or whether they’re just making it up,” Toubman said. Halsey said that DSS has “every intention” of providing that data. Also at Wednesday’s meeting, several stories were told about continued missed appointments, late pickups and out-of-pocket payments for transportation. Bonnie Roswig, an attorney from the Center for Children’s Advocacy, said one of her clients, a mother with a child with cancer, paid about $300 out of pocket to get her child to oncology and chemotherapy appointments. Since Jan. 1, on three different occasions, the mother scheduled rides with Veyo but they never showed up — the latest instance being on Wednesday morning, she said. After hearing Roswig’s account and other stories, Halsey said DSS is taking the issues with Veyo seriously. The bill approved by the House would safeguard people with pre-existing conditions who are on short-term health insurance policies. It now heads to the Senate.